Groundwater Sciences Corporation (GSC) engaged in a water supply development project for the Town of New Windsor to increase the production capacity of the municipal water supply system. 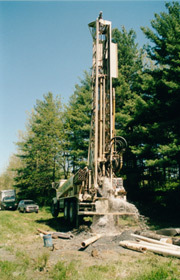 The project involved the exploration and test drilling of several sites on a large tract of land owned by the town in the upper reaches of the watershed that includes an existing town spring water supply. 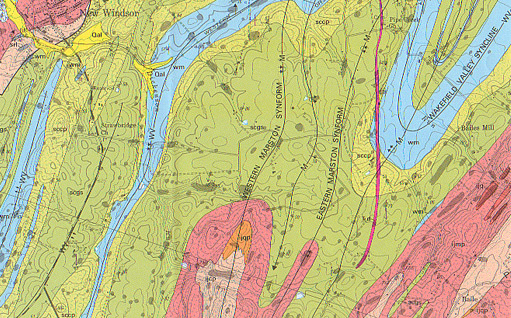 The geology of the project area was partly schist terrain, with the majority of the project area underlain by metavolcanics and discontinuous interbedded marble. Well development was complicated, with many karstic and highly weathered marble layers. One production well was sited, tested, and permitted in the schist terrain, while seven test wells were drilled in the metavolcanic and marble terrain after being sited with the aid of geophysical surveys and fracture trace analysis. Eventually, a second production well was developed with a higher than expected yield in the challenging metavolcanic terrain and without any impacts to the town’s nearby sensitive spring supply.